The Adder is the only venomous snake in the UK but is not an aggressive species. 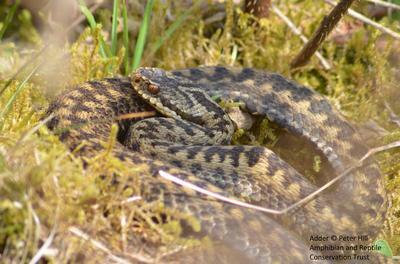 Adders are mostly found in areas of rough countryside with edge habitats. They grow to no more than 75cm long with the females longer than the males. They are variable in colour but always have a distinctive dark zig-zag down the spine. The best way to find them is to move slowly along the edge of a path through bracken but even then you will need to be very quiet and have a keen eye to spot them. For more information see the Froglife Adder page.